100% non-oiled sisal rope for toy making. Price is for one foot. When ordering in multiple quantities, you will receive one continuous length of rope. Sisal Rope UNOILED White 1/4"
Bird safe! Unoiled sisal rope is the only sisal that is safe for birds. 1/4" thickness. Great for making hanging toys or foot toys! Price is PER FOOT. If ordering in multiple quantities, you will receive one continuous strand, unless otherwise specified. 2mm hemp rope skein. Very thin but strong hemp rope for use with toy parts with small holes. Great when making little bird toys. 1/8 hemp rope skein. Strong hemp rope for use with toy parts with small holes. Great when making hanging bird toys or even foot toys! You receive 20 feet. If ordering in multiple quantities, you will receive one continuous strand, unless otherwise specified. Lavender Kraft paper - great for toy making! Leave woven or unravel. Hide treats inside. Endless possibilities! Orange Kraft paper - great for toy making! Leave woven or unravel. Hide treats inside. Endless possibilities! Green Kraft paper - great for toy making! Leave woven or unravel. Hide treats inside. Endless possibilities! Yellow Kraft paper - great for toy making! Leave woven or unravel. Hide treats inside. Endless possibilities! 5/8 inch diameter. Super thick! Available in green or yellow. A My Safe Bird Store exclusive! 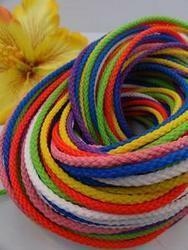 100% natural coconut rope. Slightly over 1/8" thick. 3 feet long. A natural, safe rope for toy making. BEST BUY! 100% natural coconut rope. Slightly over 1/8" thick. 18 feet long. A natural, safe rope for toy making. Please note: If you order in multiple quantities, you will receive one continuous strand unless otherwise noted.